Testing out the first shot ski -- on Oct. 22, the actual shot ski will be 100 times this length and stretch all the way down Main Street. From left to right Sunrise Rotary members: Bob Briggs, Connie Nelson, Joel Fine, Gail Laser, Dell Fuller, Jon Grech, Mike Luers, Mike Washington, and Glen Perry. On January 9th, 2014 exactly 881 people lined up in Breckenridge, CO during their annual ULLR Fest to drink from an enormous shot ski. Save the date because on October 22 Park City Sunrise Rotary will attempt to claim the title for our town with the inaugural Annual Park City Shot Ski. If you're not familiar with the Sunrise Rotary, they're a service oriented club with the motto of "Service Above Self" that focuses on local charities, causes, and interests. All the profits from the shot ski event will be given to the Sunrise Rotary who donate 100 percent of the funds back to local non-profits. 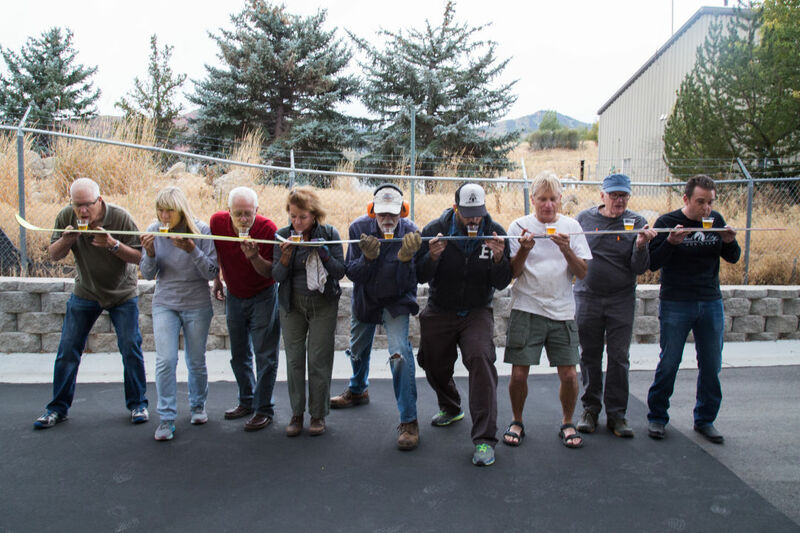 The idea for the shot ski originated with Sunrise Rotary members Connie Nelson and Mike Luers found out about the feat and decided it was time for Park City to claim the title. For $15 participants will not only be able to take part in the shot ski, they'll also get a bumper sticker for their car and have access to the beer garden during the event. While the actual shot ski will be at 2 p.m., revelers can hang out in the beer garden starting at 12 p.m. where there will be live music, games, and, of course, libations. The Sunrise Rotary is shutting down all of Main Street between 8 a.m. and 3 p.m. for the event because the final assembly needs to be done at the location. Less than a month out from the date, the Sunrise Rotary has collected 350 skis and put in roughly 70 hours of work. We visited them on one of their workshop nights to find a well-oiled machine consisting of just a few people. They're sanding, sawing, removing bindings, drilling, and measuring each ski for cup placement so they're ready for the big day. As you can see, the build is well underway and members assured us they've had no problems getting the volunteers needed to get the shot ski ready. What they need now most of all is for people to sign-up to meet their goal of 1,000 people. So grab all of your mates (21+ over only), buy your tickets here, and let's prove that Park City really is the best watering hole in Utah!